Stevedore Patrick’s $100 plus GST a load charge for handling Port Botany sideloaders is excessive and will push many smaller operators out of the business, the New South Wales branch of the Australian Trucking Association (ATA NSW) believes. 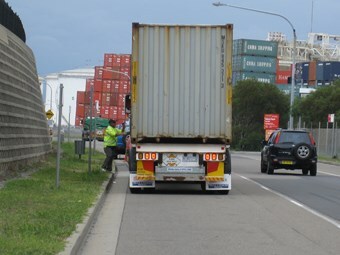 <br /><br /> ATA NSW container committee chairman Mike Moylan says while he understands that there are safety issues involved and that this had been discussed at Port Botany Road Taskforce. However, there had been no consultation on the amount of any charge, when options were canvassed. Stevedore Patrick’s $100 plus GST a load charge for handling Port Botany sideloaders is excessive and will push many smaller operators out of the business, the New South Wales branch of the Australian Trucking Association (ATA NSW) believes. ATA NSW container committee chairman Mike Moylan says he understands there are safety issues involved and that this had been discussed at Port Botany Road Taskforce. there had been no consultation on the amount of any charge, when options were canvassed. Patrick’s Port Botany Terminal Manager Ben Wicks claimed in a letter to container carriers last week that it had been "considering the implications of an increased volume of side loader trucks". "Side loader trucks are a non-standard type of trailer and represent addition risk of damage," Wicks writes. He adds: "Stevedores now employ a full time person 24/7 to assist in the correct loading and communication to load/unload side loaders". This fee has been implemented in accordance with the protocols and new pricing associated with the PBLIS [Port Botany Landside Improvement Strategy] Mandatory Standards. "We regret the cost bus we reserve the right to recover the cost that we incur for this specialised equipment." The announcement was greeted with cynicism in some Sydney trucking circles, where the view was that the charge was a gouge. "The bottom line is that you can understand where they are coming on a safety issue because, it was explained to us that they do have difficulty, when operating their machinery, of sighting the arms and so forth on the side-loaders," Moylan says. "And that’s forced a lot of carriers away from wanting to send their side-loaders to the port. "But the charge is totally excessive." He confirms that options raised in discussion on the safety issue included barring side-loaders, taking them out of the truck turnaround regime or having a charge. Carriers were caught in in a cleft stick as the alternative to side-loader payments was double-handling at a carrier’s own yard or paying for container park lift and a day’s storage. Meanwhile, it continues a trend to shifting more and more costs down the supply chain, many of which end up with carriers who have great difficulty passing them on, Moylan says. "I’d like to see their costings on it and I’d like to see how they worked that out. "It’s right up there with DP World – if you’ve got to go to the delivery office and do a manual process, their charge is $120."